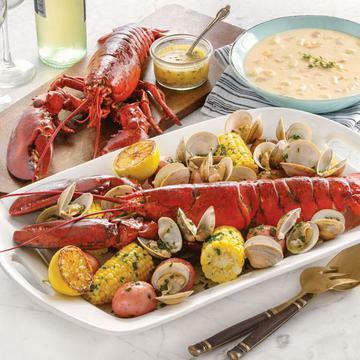 Fresh lobster joins a variety of authentic dockside favorites to create the ultimate clambake. STEP 1: Find the largest pot you have and then fill it � full with water and bring to a boil. STEP 2: When the water is at a full, rolling boil, carefully drop your potatoes directly into the water. Cover and boil for 10 minutes. STEP 3: Grasp the live lobsters firmly around their back, just behind the head, to safely pick them up, and then gently slip them into the water. We recommend you leave the rubber bands on the claws for safety reasons, but feel free to remove if you prefer. Add the bag of clam chowder to the pot, keeping it contained within the bag. Cover and cook for 5 minutes. STEP 4: Gently add the provided clams (in mesh bag) to the pot, as well as the provided corn (still in the husk). Cover & cook for 3-5 minutes. When everything is done, the lobsters will turn red, the clamshells will open, & the potatoes will be easily pierced with a fork. STEP 5: Dig in! Serve with the broth and melted butter (also provided), and savor the experience. Fresh clams typically come with some sand inside them, but we can help you with that. Save the cooking broth and pour it into a bowl, simply dip the clams in the broth to help remove any sand that may be inside. Go ahead and discard any clams that don't open up. If you're looking for a special treat, you can serve the clams with melted butter! Put �" of water in a large sauce pan and bring it to a boil. Add the clams, cover with a lid, and cook for approximately 4 minutes. After the shells open, let them cook another minute. Discard any clams that don't open up. Drop clams inside their mesh bag in boiling water with lobster if there's room. Watch for outer clams to open within a minute or two. Once they do, cook for one minute longer. Remove the bag with a long-handled fork or tongs. Cut open and carefully pour into a strainer. DIRECTIONS: On your stovetop, place the unopened soup pouch in boiling water. Heat for up to 10 minutes, until soup is hot and bubbling inside. Remove the pouch, but be careful, the content will be very hot. Secure the pouch in a bowl, holding it by its corners or seams, and then snip the corner off to pour soup into the serving dish. If grilling is your plan, grab some heavy-duty foil wrap. Soak your corn (in the husk) in cold water for about 30 minutes. Wrap each ear of corn in foil and then place on a medium-hot grill. Cook for a total of 12-18 minutes, turning four times so each individual side cooks evenly. When you're done, remove the husk and silk very carefully. The silk should slide off easily but be careful, it will be hot! Littleneck Clams, Live (Wild): (3oz. serving (85g) calories 126, calories from fat 15, total fat 2g, saturated fat 0g, trans fat 0g, cholesterol 57mg, sodium 95mg, total carbohydrate 4g, dietary fiber 0g, sugars 0g, protein 22g, vitamin a 10%, vitamin c 31%, calcium 8%, iron 132%. Wild caught, product of USA.